Earlier in our Blogpost we had mentioned the third party application through which Android and Apple iOS users can access Microsoft Office Word, Excel and PowerPoint Docx files because of non-availability of official Microsoft Office App from Microsoft, but now good news for MS Office users of Apple iOS and Google Android that soon you will be able to get Official Microsoft Office Suite for iPad, iPhone and iPods and also for Google Android devices. According to BGR report Microsoft is soon going to release the official Microsoft Office Suite for iOS and Android running devices (may be in November-2012). Microsoft has confirmed the news that they are working on a version of its widely popular MS. Office Suite for iOS and Android devices. 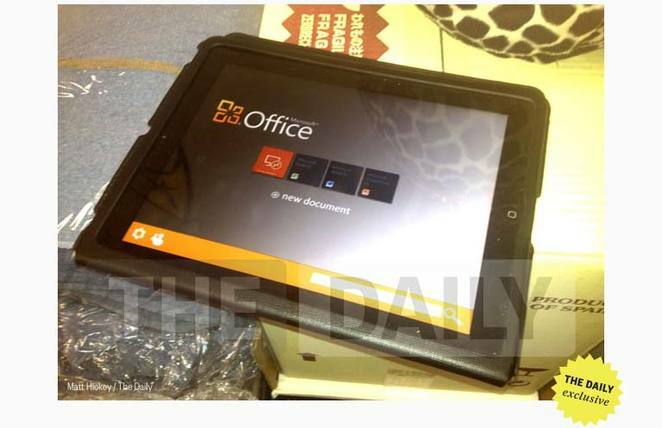 The Daily has managed to get some of MS. Office leak pictures which are soon going to release for general public worldwide. You can also see the above official image of MS. Office for iOS and Android devices which could release in November-2012 or even goes further to say that it could come to all Apple iOS devices as the product was labeled Office for iOS. Microsoft Office for iOS and Android will be capable to bring Word, Excel and PowerPoint functionality to Apple’s and Android tablets. Microsoft might be introduced additional applications in the future. The official Microsoft Office Suite has a similar look to Microsoft’s OneNote app for iOS, which borrows largely from the Metro-themed Office software on the Windows Phone platform. According to The Daily’s report, Microsoft plans to submit MS. Office for iOS to Apple for approval in the coming weeks, though a firm time frame was not provided and may be company will submit Microsoft Office for both iOS and Android simultaneously. When the whole news was asked from Microsoft for further clarification Microsoft has denied about the above picture and didn't even comment on it whether its fake or not or company is still working on Office version for iOS and Android. But we will see and wait till November-2012 to get any further update and news from them.